We are a couple in our early thirties who love getting out there and seeing Australia. Way back in 2011 we packed up our everyday life back and hit the road.. The normal life achievements weren’t doing it for us. We were happy newly-weds, had good careers, a lovely house and everything a young couple could ask for…….but we wanted more……and we were restless. We quit our careers …… cue crocodile tears. We sold up everything we owned ……. cue minor tears. We left behind our families, friends and beloved petcat ……. cue heavy sobbing. All so we could throw caution to the wind and set out on the trip of a lifetime. 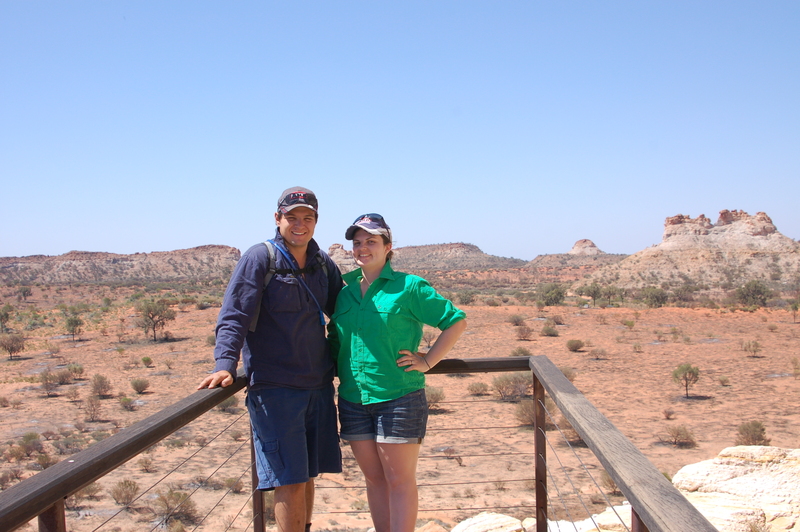 An all Aussie adventure; travelling and working around our beautiful and vast continent. We figured a year or two would be our limit and thought we would be settled back into our old life. Alas, destiny or whatever is out there had other ideas. Five years on the road and we have settled in the beautiful Northern Rivers region of NSW…..for now. We are a plant with shallow roots which is easily relocated. We were married in January 2010 and set out officially in 2011 after various short term trips. We thought marriage was an adventure – but life on the road well that takes adventure to a whole new level. Check out our actual home on the road here. Shaun is a qualified Boilermaker and loves everything mechanical and Sarah qualified in Comms, Relations and Marketing who loves all things photography and writing. Together we love travelling, camping, four-wheel driving, hiking and exploring our country – every single inch of it. Our travels began as a quest to find a place to call home, to settle down and raise a family. The only problem was our nomadic lifestyle became so addictive, and now we have ‘settled’ our life is never going to be ordinary, it is going to be extraordinary! 3. because we believe that Australia is THE destination – it has everything the keen traveller needs; from the coast to the outback, the desert to the rainforest, from the city to the sea, Australia has so much to offer. Whether you’re backpacker, a millionaire, a family, a single-person, a twenty-something, a grey nomad or anyone else you really need to see it for yourself. You simply must SEE AUSTRALIA. We are currently based in Northern NSW. At every opportunity we hit the open road to explore Australia. We work to live, not live to work. Have a fabulous and absolutlely safe adventure…. we have both a hard copy and a digital copy of the CAMPS Aust. Wide. It is fantastic. My husband and I love free camping. There are some nice Caravan Parks around and we do like stopping there now and then for those extra luxuries; washing machines, hot water and maybe even a pool. 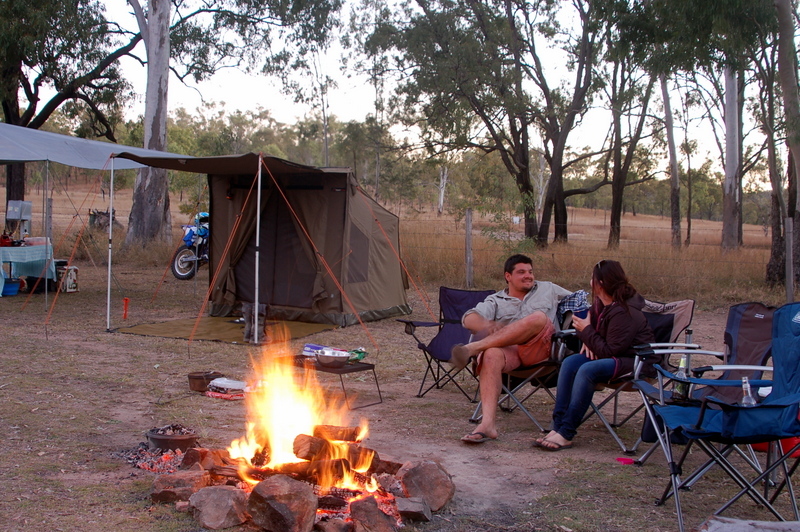 But our most favourite campsites are the free out in the bush campsites. Just you and a million stars. AMAZING. You can’t buy that anywhere. I admire you embracing the nomadic lifestyle I wish I had done more of it when I was younger but am making up for it now. Thanks for stopping by my blog. I will be interested to read about your journey as we will be travelling up to Northern Western Australia later this year for a holiday, so looking out for tips on things to see and do. Thanks for commenting. I have already travelled up to North Western WA. It is truly amazing. Both the desert and the WA coastline are must sees. Tomorrow I will send you a list of places to see and things to do if you would like! When are you heading up there? Hey wonderful partnership. carry on your life. Wish you all the very best. We wish you all the best for 2012 and a lot of success for your blog. Your project sounds fantastic. All the best with you venture. I wish you every success. Congratulations on making the break. Thanks for taking the time to comment. It was a big thing to take the leap but now that we have done it I wouldn’t have it any other way. This lifestyle is ADDICTIVE! Hi there, Thanks for liking my blog (blazingmyowntrails). I (Shawn) read your your story to my wife (Sarah) and our jaws dropped, not to mention really appreciating your journey. We traveled, camped, hiked, photographed a lot before kids and now we are on a slow down with our two little girls but not for long. Maybe we’ll start another blog about traveling the countryside WITH kids. Best of luck to you both and looking forward to your adventures. Sounds like a great adventure. I will be following along…thanks for visiting my site! Thanks for stopping by and taking the time to write a comment. It is one BIG adventure. I love writing knowing people are following our story. You have to live your dreams, and make the most of what you can achieve, everyone is different and has their own special ideas and dreams. Whatever they are; following them is one of the ways life makes you smile! Enjoy your travels and the inspiration it will bring to others! THAT’S AMAZING!!! It’s exactly what we are doing! Jobs quit, freshly wedded and loving the gypsy lifestyle!! I hope you find our Blog useful. I’m having a peruse of yours this evening with a cup of tea in hand! We are currently stranded in Melbourne as our faithful 4wd ‘Betty’ gets fixed, she needed her engine re-building unfortunately! All part of the adventure though! Ooo stranded in Melbourne is not a bad thing. Did you know there is a camping show on there in 2 weeks time. It’s the biggest in the Southern Hempishere. We are heading down there for 4-5 days over that period to upgrade a few things. How long have you been on the road? If you give me the link to your blog I can add it to my links on ours. Hope “Betty” get’s better soon. No problem at all. Thanks for stopping by and commenting. Our e-mail is ssnorris@live.com send any destinations you think are worth stopping by. We LOVE feedback. For our third visit within 18 months! We love it there. We love the Simpson also. What lead you to Birdsville? Fantastic! You’ll have to come and introduce yourselves. I’ve only just found your blog but already am loving it and finding lots of inspiration to get out there in the volksie. I moved to Birdsville on a whim after finishing uni but Sam was more or less born here. Are you heading through the desert again?See you soon! from here (Griffith, NSW) we head to the Flinders Ranges, Up the Birdsville Track (if it is open to 4WD’s – weather permitting) and then onto the Plenty Highway where we are going to work for 3 mths or so on a cattle station. I bet you are finding Birdsville very interesting to relocate there) I read your blog also – just imagine the adventures you will have once the “volksie” is ready!!! Thanks for your interest and sharing us with your friend. All the best with your adventures and good for you for letting go of the “traditional” way of life to forge your own path! Enjoy the journey! Fantastic.I am so looking forward to the various installments of your adventure. Thankyou for the following and look forward to reading more posts as they happen. Thank you for following us here at http://www.norrisaroundaustralia.com we are so passionate about our country and loving sharing our passion with others. More power to you guys. Enjoy it before the little rugrats come along. Then you’ll be stuck for at least 25 years. That’s the plan. We will travel with our children one day but not full-time… well we don’t think we will. Who knows. Sounds grand! 🙂 Here’s to a happy future together, and thanks for the follow. Thank you for stopping by and the nice words. Something I wanted to do here in the US with my hubby before we had kids, but he nixed the whole idea. I doubt now I will ever get to Australia, so I will just tag along and see it through your eyes. Wishing you both joy and great adventure! I hope you are wrong and that someday you get to enjoy the beauty of Australia. You have seen some lovely places so far. I’m sure you’ll enjoy the rest of your adventure. Thanks for visiting and following Miscellaneous Eclectica. I hope you like my bits and pieces. Wow, that sounds like a great journey! We did the same thing- quit our jobs and gave up our home and went traveling for a year. Now we have permanent jobs again, but our adventure hasn’t stopped! Just because you settle down doesn’t mean you can’t have fun anymore 🙂 Enjoy your journey and stay safe! By the way – settling down is not a prerequisite to raise a family. I think raising children while travelling Australia would be awesome. They profit so much from the interaction with nature, other people and the closeness of the family. Perhaps once they reach school age it is time to settle down. On the other hand there is always home schooling. I have met people travelling in Northern Africa with 5 year old children. The children were so open minded, interested in anything around them – so different to the boring kids you meet normally. You are making memories you will never forget. Good for you! Thx for your recent follow of my blog!! Hi Shelly and George, Thanks for stopping by our website. We love sharing our travel tales with like minded people! All we aim to do is share and inspire! Great site! We’re about to take off for the next couple of years on our adventure around this great country. March 19th. We pick up the camper next week. Like you, we want to blog our trip mostly for the kids. I have a question which I’m sure I read on the site but can no longer find it – but what tools did you use to plot your travels on the map at the near top of this page. How exciting! Good on you! We simply use paint in Windows to plot out maps. However, there are numerous apps which you can use now to plot your travels. There is even an app in Google maps you can use! I am Hoa Nguyen from http://www.vietnam-visa.com/. May I reach you via email please as I would like to discuss with you about collaboration chance between us? Please get back to me if you get the message then. This is a great post. It reminds of trips with my family and friends before. We often do this nowadays. But we are planning to do it again this summer. Thank you for the inspiration! This is nice!! It reminds me of our family trips back then, all the happy memories and fun stuff. We are planning to have a trip again this summer. I am a food lover. I am trying to eat all kind of testy food. For that I am going almost all the restaurant. It is my hobby to test many types of delicious food. From all the restaurant of Broadbeach I think Osushi is the best restaurant for making delicious food. Great food served with style is the hallmark of O-Sushi Broadbeach. Just stumbled across your blog; sounds amazing. I shall dig in and read up! G’day mate. In the form of not trying to sound too cheesy your trip sounds great. I know some might classify this as spam but here I go anyway. A couple of colleagues and I from Melbourne started a travel website thats trying to collaborate with businesses, locals and travellers to offer the most unique and coolest things to see and do around the world. And for people to also add their awesome trips to our site so people can fellow their progress. If your at all interested in working with us or if anyone reading this wants to check out our travel site it’s http://www.hopolla.com. Thanks for reading and I wish everyone the best of travels. Please add your blog to Australian Travel Bloggers! It is a free resource set up to showcase Aussie blogs and we also have a facebook group for Aussie Travel Bloggers. I have a neighbour who has the same name and we are located in Cape Breton, Nova Scotia. Canada. We are all in our late 50’s-70’s.. Amazing.! Thanks for the outstanding blog. I enjoyed reading your post.